As the Charles Taylor trial continues, African historian Carina Ray looks at the possibility that Taylor was complicit in Sankara's assassination. In January 2008, after much delay, the trial of former Liberian president, Charles Ghankay Taylor, is scheduled to begin at the International Criminal Court in The Hague. Taylor faces an 11-count indictment for crimes against humanity, war crimes, and other violations of international humanitarian law. These charges stem from his involvement in the atrocities committed during Sierra Leone's armed conflict dating back to 1996, and more specifically his support of the main rebel group, the Revolutionary United Front (RUF), headed by Foday Sankoh. The brutality of the war and its direct toll on the civilian population are most visible today in the thousands of amputees throughout Sierra Leone whose limbs were hacked off in a bid to stifle civilian resistance through fear. While Taylor's path of destruction arguably came to its apex during the war in Sierra Leone, his history prior to that also deserves our scrutiny since we know his much longer record of wanton destabilization in West Africa is precisely what allowed him to wield so much power within the RUF. In particular, Taylor's return to West Africa from the United States in 1985 and the events that followed deserve our attention. Taylor arrived in Ghana after escaping from a prison in Boston, Massachusetts where he was being held pending extradition to Liberia on embezzlement charges levied against him by the Doe regime. Ghanaian authorities eventually jailed Taylor twice for his increasingly subversive activities. By 1987, however, he had arrived in Burkina Faso. The approximate timing of his appearance in the country coincided with the assassination of President Thomas Sankara, the charismatic revolutionary leader of Burkina Faso, on 15 October 1987. 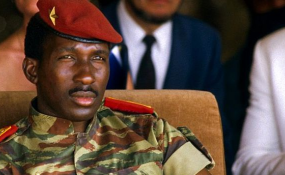 While it is commonly accepted that Burkina Faso's current head of state, Blaise Compaore, ordered Sankara's assassination after their once close relationship soured, for years people have also been linking Taylor to the assassination. In 1993 Liberian economist, S. Byron Tarr, published an article in the respected academic journal, Issue: A Journal of Opinion, on the Economic Community of West African States Monitoring Group's (ECOMOG) intervention in the Liberian civil war (1989-1996). Therein Tarr gave the most detailed account to date of Taylor's movements prior to Sankara's assassination. According to Tarr, in 1987 Taylor approached the Burkinabe embassy in Accra to ask for assistance in overthrowing the Doe regime in Liberia. The Burkinabe ambassador to Ghana, Madam Mamouna Ouattara, a Compaore loyalist, appears to have solicited Compaore's assistance in getting the Ghanaian authorities to release Taylor into Burkinabe custody. This was facilitated by the fact that Ghana neither wanted to hand Taylor over to the Americans nor to Doe, and so Rawlings apparently released him to Compaore who had come to Accra as part of a mediation process Rawlings had undertaken to resolve the mounting disagreements between Sankara and Compaore. Tarr, notes that "Not long after Taylor was delivered to Compaore, Sankara was murdered." In exchange for Taylor's assistance in carrying out Sankara's assassination, Tarr suggests that Compaore provided assistance to Taylor who was in the process of organizing the guerilla war that would eventually lead to the overthrow of the Doe regime. Crucially, Compaore is believed to have introduced Taylor to Libyan president, Muammar Qaddafi. Taylor and his recruits subsequently traveled to Libya where they underwent guerrilla training and formed a strategic alliance with Qaddafi who supported his desire to overthrow the Doe regime. The training he gained there was critical to his ability to launch the Liberian civil war in 1989 from his base in Ivory Coast. This general version of events has been echoed more recently in articles that have appeared in several other forums, including the Liberian Democratic Future's (LDF) on-line newsmagazine, The Perspective, and The Liberian Mandingo Association of New York's website. It must be pointed out, however, that this version of events has been called into question. Ghanaian political scientist Eboe Hutchful who serves as the executive director of the Accra-based NGO, African Security Dialogue and Research, has suggested that his Ghanaian informants dispute the idea that Ghana released Taylor to Compaore; rather they contend that he was taken to the Ivorian border and released there. From Ivory Coast he is said to have made his way to Burkina Faso, "where the Libyans introduced him to Compaore," rather than the other way around. Moreover, Hutchful suggests that Sankara may have already been killed by the time the Ghanaian authorities released Taylor. The striking aspect of each of these sources is that they treat Taylor's possible involvement in Sankara's assassination as a side note. To date, the question of what role he played in organizing and carrying out Sankara's murder has not been the focal point of investigation. In March 2006 the United Nations Human Rights Committee ruled that Sankara's family has "the right to know the circumstances of his death." Any attempt to shed light on these circumstances, therefore, must seriously consider whether Taylor was involved in the assassination, and if so, to what extent and under whose direction. *Carina Ray is Assistant Professor of History at Fordham University in New York City, where she teaches African and Black Atlantic History. She is also a monthly columnist for New African magazine. Copyright © 2008 Fahamu. All rights reserved. Distributed by AllAfrica Global Media (allAfrica.com). To contact the copyright holder directly for corrections — or for permission to republish or make other authorized use of this material, click here.